Whether you are a small business with a single location or a large business with multiple sites, Owl Time Clock has the product that's right for you. Owl Time Clock is the one-stop-shop for employee time tracking software, from products and supplies to service and repair. Owl Time Clock offers a wide variety of employee Time Clocks to choose from with products for both small businesses and larger organizations of up to 100 employees. Each of our branch offices provides high-level service across Canada to ensure quick, regional expertise and can offer on-site repair, hardware replacement, supplies and software support. Our Customer Care Centre is staffed by a team of qualified technicians to help you resolve issues quickly and can provide same day service so that your company will always be in control of its labour costs. Our Time Clock solutions give you complete control over your payroll to save you time and money. To order any of our Time Clock products, supplies or for service and support call us at 1-888-407-0624 or email [email protected]. With the ability to stamp date, time and minutes, and add customized comments, this multipurpose clock will become a business necessity, saving you money on payroll and extraneous meter costs. An illuminated printing area guides proper timecard alignment and the electric coil print system punches cards precisely, ensuring accurate timekeeping for payroll. Bell and music options can be programmed to signal the beginning and end of shifts. 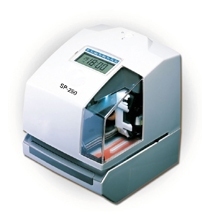 The SP 250 is suitable for small organizations and can be used with regular time cards for tracking time and attendance or if you want to track time and process spent on specific jobs, you can use it with job costing cards. In addition, the unit offers the ability to print 13 pre-programmed comments to allow supervisors to add customized comments, such as “Approved” to employee time cards. Its auto adjustment for Daylight Savings Time, short months and leap year will reduce service work required and ensure timekeeping is accurate. 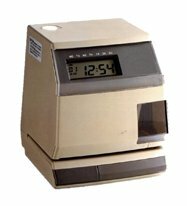 For small businesses, Owl Time Clock offers the Pix 25 electronic side printer time clock to assist employers in tracking time and eliminating the use of manual time sheets, which leads to costly payroll errors. The unit has a large, easy to read digital display and illuminated print window. Economical, yet highly flexible, the Pix 25 offers programmable print styles in regular or military time, minutes, hundredths and tenths. 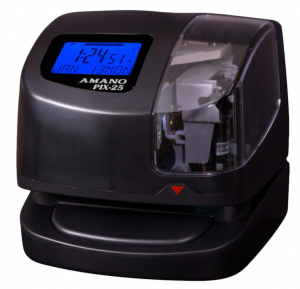 Equipped to print 10 messages on timecards, and the unit utilizes a cartridge ribbon and low-ink sensor for easy servicing. The PIX-25 Electronic Time Recorder automatically synchronizes to the NIST (National Institute of Standards and Technology) Atomic Clock via wireless radio signals so you never have to reset the time or adjust for Daylight Savings Time. For businesses up to 100 employees, the Pix 3000X is similar to the Pix 25, but more feature rich and offers the ability to add a signal relay for bell and buzzer ringing, as well as an Ethernet option to enable you to synchronize the clock to your network. This clock allows you to replace your manual time sheet method and accurately track the attendance of your employees. Economical but highly flexible, the Pix 3000X provides for programmable print styles in regular or military time, minutes, hundredths and tenths. Ten (10) messages are also able to be printed on the time card and the unit uses a cartridge ribbon for easy servicing. The clock is able to operate with automatic or manual print and automatically adjusts for Daylight Savings Time, leap years, short months, etc. Add a signal relay option to signal start and stop of coffee breaks and lunches. The unit works well with timecards, and job costing cards or job costing tickets. Exclusively offered by Owl Time Clock, the Perfect 2040 calculating time recorder is ideal for larger organizations, accommodating up to 100 employees. This electronic clock calculates hours on a daily and weekly basis, handling break rules, rounding and overtime. Exceptions in employee attendance, such as leaving early and coming in late, are highlighted in red on the timecard. In addition, the time clock generates timecard reports, and restricts employees from punching in or out during lock out periods. The unit has an attractive analog quartz clock with power reserve and automatic synchronization and is available in a desktop or wall-mounted version. The Perfect 2040 is a big time saver for a small to medium businesses that want to manage their employees and lock out employees from punching in at specific times. The built-in calculator which totals the hours daily or weekly, combined with the red highlighted exceptions printed on the timecard will reduce the amount of time spent processing payroll and save you money. 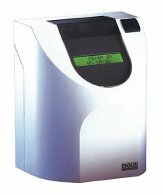 The Paymate is the top of the line standalone self-calculating time clock for smaller businesses. Its robust metal housing will withstand the wear and tear of employees and equipment in manufacturing and food processing environments. By configuring the Paymate to accommodate your specific pay policies, the clock calculates hours on a daily and cumulative basis right on the time card. 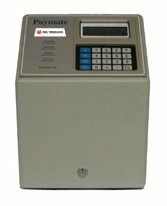 Ideal for companies with up to 100 employees, the Paymate time clock handles a variety of different pay periods and provides attendance reporting for both the current and previous pay period. In addition, the unit can be set up for statutory holidays and provides an automatic adjustment for daylight savings time. Owl Time Clock’s technicians will teach you how to set up this clock to meet your requirements and reduce the time you spend on payroll each pay period. The 4000 and 4000HD Time Recorders offered by Owl Time Clock are fast payroll processing systems that accommodate up to 100 employees. These state-of-the-art Time Recorders help eliminate errors by automatically calculating time totals for weekly, bi-weekly, semi-monthly or monthly payrolls. The rounded time option allows for clean payroll calculations by rounding to 5, 10 or 15 minutes. The 4000 and 4000HD Time Recorders can be programmed in regular time, military or true military time and have a built-in battery that allows for up to 30-days of backup in case of power failure. Capability to print in 4 languages: English, French, Spanish and German. The 4000HD model offers heavy-duty steel construction to withstand years of use in harsh environments such as manufacturing plants, industrial garages, and commercial locations. For accurate, error-free payroll tracking for businesses with up to 100 employees, Owl Time Clock offers the 5000+ Auto Totaling Time Clock. This advanced time clock automatically calculates employee time totaling for weekly, bi-weekly, semi-monthly or monthly pay periods. The rounded time option (5, 10 or 15 minute rules) can help simplify your payroll with clean calculations. 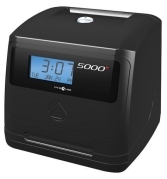 The 5000+ Auto Totaling Time Clock features an easy-to-read, backlit LCD screen and internal battery backup that safeguards data and settings for up to 30 days without power. Plus the tamper-proof security lock helps protects against costly time theft. Print in regular, military or true military time format and multiple languages (English, French and Spanish). Its auto-align top loading time card feed saves time, eliminates card jams and enables single-hand operation. 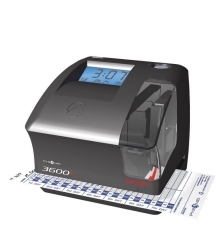 Owl Time Clock’s new 3600SS Time Clock & Document Stamp features the patent-pending SmartSite™ alignment guide to ensure perfectly aligned time card punches and document stamping every time. The 3600SS is equipped with 14 useful message selections and the option to customize your own date stamp with up to two lines of type. Take out the guesswork in time card punching and stamping with the SmartSite™ Red LED alignment guide and bird’s eye viewing window. Simple to set up, the 3600SS has carefree, automatic reset for Daylight Savings Time and is equipped with internal battery backup that safe guards date and settings for up to 30 days without power.